Three layers of flavorful fall goodness make these Pumpkin Butter Bars a delicious dessert option for chilly autumn evenings. 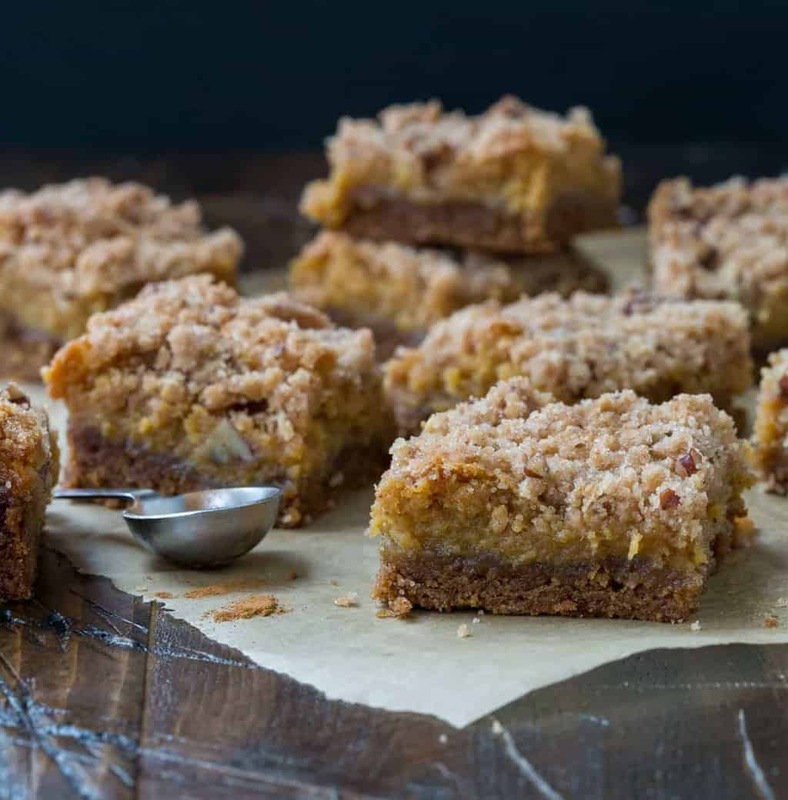 These Pumpkin Butter Bars are my version of a similar bar from Williams-Sonoma years ago. I was browsing in the store when they were giving out samples of pumpkin bars, but I couldn’t bring myself to shell out the $20+ for the specialty ingredients needed. So I came home, tinkered with the recipe and came up with a tri-layered recipe that I think knocks the socks off the original. The bottom layer of these Pumpkin Butter Bars is essentially a pumpkin quick bread mix that gives the bars a spiced cookie-like bottom. You can pick up a pumpkin quick bread mix at any grocery store this time of year (I grabbed mine at Trader Joe’s). The second layer is a decadent pumpkin butter and cream cheese mixture that is topped with a crunchy pecan cinnamon streusel. It’s chewy, creamy and crunchy all at the same time, plus it’s loaded with fall pumpkin flavor. Jackpot! Tip: I used a store-bought version of pumpkin butter (also Trader Joe’s), but pumpkin butter is crazy simple to make if prefer that route. Check out this easy crock pot Pumpkin Butter recipe from Sue at The View from Great Island. These Pumpkin Butter Bars are quite rich, so one 9 x 13 pan will easily feed a crowd which is great for all those fall get-togethers and tailgating parties. These bars keep well, too, so feel free to make the recipe the night before. Rinsing your knife with hot water between cuts will also help give you clean lines on the bars but I find that appearances don’t matter after one bite of these bad boys – unless you count wiping the crumbs off your face. 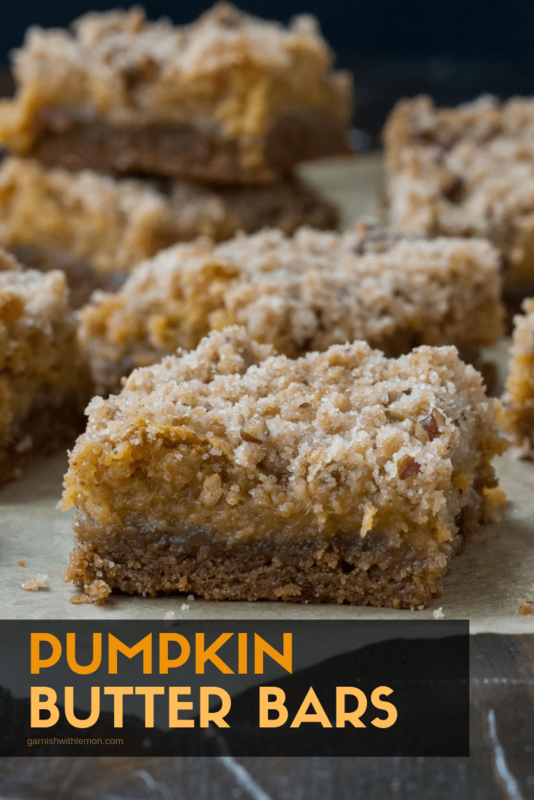 These Pumpkin Butter Bars are filled with all of the flavor of fall! Beat together cream cheese and pumpkin butter with a mixer on medium speed until smooth. Stir in eggs, vanilla extract, 8 tablespoons melted butter, cinnamon and nutmeg and mix on medium for another minute. Gradually add the powdered sugar until combined and then beat with mixer for another 2 minutes until smooth. Pour filling into baking dish. Whisk together sugar, flour, cinnamon and pecans in a small bowl. Stir in melted butter and evenly spread streusel topping over batter in pan. Bake for 45-55 minutes. These bars will be a tiny bit wiggly in the center when they are done. That's OK. They will set up more as they cool. Place on wire rack for at least 20 minutes or until completely cool. Cut into bars and serve. Delicious! I tried it today with homemade pumpkin butter.